Essay Competitions for College students and school children - Essay Competitions in the Cause of National Integration and Communal Harmony: Rc. No 557: Sub: School Education, Telangana, Hyderabad NIC scheme to State Governments for conducting Essay Writing Competitions in the cause of National integration & Communal Harmony. Submission of estimates by 15th October, 2018. All the RIDSES and DEOs in the State is invited to the reference read above and they are informed that the Govt. of India has introduced a scheme for conducting Essay Writing Competitions based on National Integration & Communal Harmony for college students and school children is in operation since 1998. The details are available at website of this Ministry at www.manic.in. 3. SUBJECT: The topics of Essey should be selected every year from themes based on National Integration and Communal Harmony. The topics should be decided by the State/UT Authorities, in consultation with the Departments of Secondary & Higher Education, Home, Finance and Planning, State University Grants Commission State Council for Higher Education etc. 4. MEDIUM: Hindi/English or official language of the State/UT. 6. 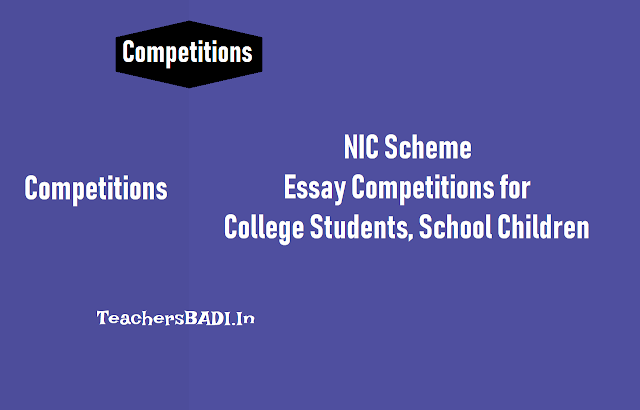 HOLDING OF ESSAY COMPETITIONS: Instructions/Govt. Orders may be Issued to the concerned authorities to conduct the competition indicating details We date of receipt of entries by a specified date, date of competition ete so that all formalities are completed well in time. The conduct of competition, caution of Coys and final lists of awardocs should be completed positively by 15th September every year. 11. ADMINISTRATIVE EXPENSES: Administrative expenses like printing of certificates, compilation of prize winning essays etc. up to a maximum lnit of Rs.500/- (Rs. Five hundred only per district for school children and Rs 2.500/ (Ro. Two thousand & five hundred only) per State/UT for college/university students may be incurred. 12. REQUIREMENT of FUNDS: The Joint Secretary (18), Ministry of Home Affairs, North Block, New Delhi-1100, may be informed in the prescribed proforma Annexure-T) by 15th October every year the actual requirement of the for competitions. The name of the State/UT Authorities in whose runs the cheque/drait for the amount of prizes etc. is also to be sent together with a list of names of winners of the prices. While calculating the fund requirement, the State/UT may include the payments of prize money.